Myth #1: Air conditioner filters should be replaced when you think they are full of dust – even once a year is ok. Reality: Actually, the EPA’s Energy Star program recommends that you change your air filters monthly, or at minimum, every 3 months. Households with pets and people with allergies should be especially careful to replace the filter on a regular basis. Dirty air filters can inhibit airflow and force your A/C to work harder. This wastes energy and may cause the premature death of your air conditioner. Myth #2: It’s a waste of time and money to have your air conditioner serviced. Reality: False. Regular cleaning can keep your unit running smoothly and efficiently. It also provides an opportunity for experienced service techs to catch problems early – before they become crises. 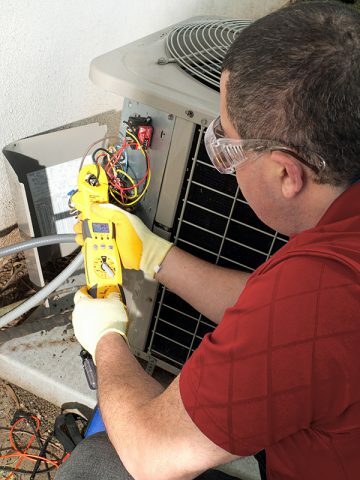 Ignoring regular maintenance can mean an emergency call to the repair company while the heat continues to rise. Myth #3: Using an air conditioner will give you a cold. Reality: Completely untrue. Medical professionals agree: while becoming chilled may make you more vulnerable to illness, the common cold is caused by a virus, not the temperature. Go ahead, turn on the AC – but keep your home clean and wash your hands often to keep those cold viruses away.